Green Beaver is a Canadian company that offers a wide selection of natural and eco-friendly personal care products. I have tried a few of their products in the past and they have always worked well for me. I am late getting this review done as it was for their new winter skin care line Green Beaver Apres Ski, but if you do have dry skin it is something that can plague a person year round and not just in the winter. Cold water is harsh on our delicate skin and can aggravate any pre-existing skin issues. John has dry skin and finds that the cold weather makes things worse. He has issues with skin irritations on his arms, face, back, etc…So he was my guinea pig for one of the review products. My skin usually fares ok in the winter because of its extreme oiliness. 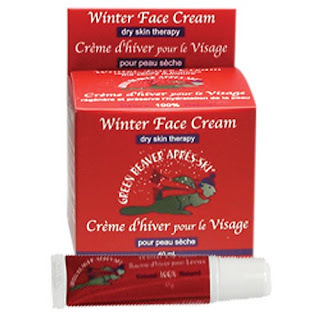 Green Beaver sent me two products to try out-Winter Face Cream and Winter Lip Balm. The Winter Face cream is made with extra rich shea and cocoa butter that is meant to help restore moisture to tight, dry skin. John used it mainly on his cheeks as they got really dry especially after working outside all day in the wind and cold. He liked that it was not greasy and absorbed fairly quickly into the skin. You just need a little bit and really rub it in good. He didn’t mind the smell and liked that it wasn’t a “girly” scent. It’s hard to describe the actual scent just that it is nice and fresh smelling. Since it is a natural product, it is safe to use on sensitive skin. John said it didn’t burn or hurt to apply as sometimes creams do on him. He liked that it helped soothe his sore skin and he said he wants to keep some in the house in case he has this issue again. The Winter Lip Balm is something I will be using year round because it is just such a fantastic product. It is soft-long lasting balm that soothes and protects red, dry lips. It is unflavoured (so you won’t be tempted to lick your lips and make them dry again) and contains aloe and vitamin E. My lips are always cracking so I am constantly applying lip balm. I liked that this particular balm lasts for a good few hours and soothes sore lips. It kind of reminds me a bit of vaseline except a thinner consistency and not as greasy. John even used this a few times and appreciated that it was unscented and unflavoured. I guess that’s a guy thing. If you suffer from dry, sore lips give the Green Beaver Winter Lip Balm a try. Green Beaver products can be found in natural health stores across Canada. What Are Your Questions About PR? I would love to try their green tea facial moisturizer!